Brother MFC J5320DW is a multifunctional printer with a simple looking design. The printer is a perfect choice for small office and home users. The small looking device is capable of printing, scanning, as well as copying. It also has a 30-sheet ADF, fax, duplexer and a large touch screen LCD display. Even after all these features the printer surprisingly have a compact and attractive design. Like other Brother printers in this series, this one also takes the input feed in landscape mode. The printer has one 250-sheet paper tray, at the front, that can handle anything from 15 x 10cm photo blanks up to full A3 sheets. There is one more input slot at the back of the printer that is build for A3 sheets. The flat top surface of the device smartly holds a 30-sheet ADF and a single sheet flatbed scanner. The printer uses Brother MFC J5320DW ink cartridges that produce high image quality with a maximum resolution of 6000 x 1200 dpi. The Brother MFC J5320DW is a multi-functional printer that would perfectly serve a small office. It has great looks with a small footprint that help you save a lot of space at your home or workplace. It can fax, copy, scan, and print anything from 15 x 10cm photo blanks up to full A3 sheets. Along with the paper handling capacity, the printer offers wireless, ethernet, and USB connectivity and also lets the users to directly print any document from their phone, digital camera, or memory cards. You can also pick Brother MFC J5320DW ink multipack (BROTHER LC223 multipack) to save more on your printing expenses. How to Improve poor print quality of BROTHER MFC J5320DW printer? The print quality of a printer can be affected by many reasons, including, clogged printheads, old dried out BROTHER MFC J5320DW ink cartridges or improper vertical alignment of the printer etc. If your printouts have horizontal stripes in the text or graphics or have some blank text, then it is an issue of clogged nozzles of printheads. To clean these clogged printheads you need to perform a Print Quality Check on a sheet. Once the test print is out printer would show you four options and ask you to select an image (1, 2, 3, or 4) that matches closely with the print test result. If the test result matches either of 2, 3, or 4 number image then the printer will prompt a message to ask you to start a print head cleanup process. Select ‘Start’. After this process is finished printer will ask you to check the print quality. Press ‘Yes’. It will prompt the printer to run a test print. Check the output of the test print. The touch screen would display a message to ask you if the Print Quality is Ok? Press No if all the lines on the test prints are clear, unbroken and visible. It will stop the process right there. If the printout result continues with the poor quality then press ‘Yes’ to continue the cleaning process. Make sure the process repeats at least five times. If the quality does not improve after the five attempts then proceed to next step. If you have cleaned up the printhead of the printer and it does not improve the print quality then it might be possible that the ink cartridges have dried out. If BROTHER MFC J5320DW ink cartridges in your printer are older than 6 months or you haven’t used them from months, you need to replace them. Q. I got an error message from my printer saying “Hub is unusable”. What does this mean? A. The reason you got this message is because a hub or a USB flash drive with a hub has been connected to your printer’s USB slot. Hubs, including USB flash drives containing hubs, are not supported by your printer. You should unplug the device from the USB slot. Q. What is the page yield of your compatible Brother MFC J5320DW ink cartridges? A. Our compatible Brother MFC J5320DW ink cartridges are high capacity cartridges that are capable of printing up to 550 pages without requiring replacement. Q. Are Brother MFC J5320DW ink cartridges replaceable individually? A. Yes, Brother MFC J5320DW printers come with 4 ink cartridge slots, so that you only have to replace the ink cartridge of the colour which has finished. This encourages long-term savings. Q. How do I print images directly from a USB flash drive with my Brother MFC J5320DW printer? Open the device media slot cover of the printer and insert the flash drive. Select “Photo” and use the left and right arrow keys to view photos. Press the photo which you want to print and select the number of copies. Press “OK”. Repeat the steps to select more photos. Press “print settings” and select your appropriate settings. Press “Start” to start the print job. Only remove the USB flash drive from the printer after the message on the screen disappears once the print job is over. Q. Will I have to compromise on quality while using your compatible Brother MFC J5320DW ink cartridges? A. Absolutely not! Even though are compatible ink cartridges are cheaper than the original ink cartridges, they are capable of producing the same print quality as the originals. Our compatible ink cartridges use premium ink and are of high quality that has been tested under ISO standards. Q. I have placed the paper in a paper tray but the printer cannot detect it. A “Paper Tray Not Detected” message is appearing on the screen. How can I correct this? A. There may be two reasons when the display shows this message. Follow the solutions that are suitable for your case. Paper tray is not inserted completely. To resolve this, insert the paper tray by slowly pushing the tray completely into the machine. Paper jam may have prevented the paper tray from being inserted properly. Remove the paper jam, by removing paper tray and cleaning the jammed paper and then, insert the paper tray completely in the Brother MFC J5320DW printer. Q. I want to buy Brother MFC J5320DW ink cartridges on urgent basis. Can you deliver the product on Sunday? A. Sorry, but we deliver the Brother MFC J5320DW ink cartridges or any other product only between Monday and Friday from 9 am to 5 pm. If you place the order on a weekend the product will deliver by Monday morning. For more details, you can have a quick chat with our customer support team or visit our https://printerinkcartridges.ie/delivery for more info. Q. Does this printer support Wifi? A. Yes, Wifi networking is supported by Brother MFC J5320DW printer. Q. What is your cancellation policy. What norms do you follow? A. We have made very simple norms for our customers. If the order has not been dispatched we will just cancel the order and refund the amount in accordance with our refund policy. If the order has already been dispatched, you can refuse to sign for the item at the time of delivery and we will place a refund in accordance with our refund policy. Alternatively, if the order does not need to be signed for you can follow the procedure for returning the 'Non-faulty items' under the terms and conditions page given: https://printerinkcartridges.ie/terms-and-conditions. Q. How can I refill the ink cartridges for my Brother MFC J5320DW printer? Do you offer any refill services? A. We do not offer any refill services for the printers. However, the order for the compatible Brother MFC J5320DW ink cartridges can be placed on this site that will cost you almost same but guaranteed to perform better than the refilled ones. Q. One or more of my colours are not printing even all of the Brother MFC J5320DW ink cartridges are installed in the printer. The prints on the document are coming out blank. How to resolve this? Verify if the Brother MFC J5320DW ink cartridges ink cartridges are installed correctly. Follow the steps as described in the manual to check the print quality and clean the printhead. Q. Is the Brother MFC J5320DW printer capable to scan in duplex? A. No. You can scan multiple pages into the same document. But if you want duplex scanning needs or you have 2-sided pages to scan, you would have to turn them over manually. The document feeder is capable to feed only one side at a time. Q. Does the Brother MFC J5320DW printer work with windows 7? A. Yes, the printer works well with Windows 7. Q. 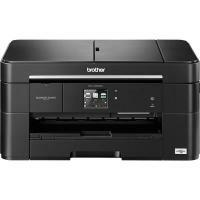 Does the Brother MFC J5320DW printer can scan in A3? A. No, the printer can scan and copy up to A4 size sheet. It can print up to A3. You could scan both halves and put it together on the computer though. Refer the user manual for more details. Q. When I print documents containing the lines in images and tables, the lines appears to be slightly aligned. What should I do to solve this problem? Finally, select the paper size as your need and click OK. The problem must be resolved now. Q. I have just set up my newly purchased Brother MFC J5320DW printer. But the screen displays Wrong Ink Color message. Is there something wrong with the ink cartridges? Do I need to buy new cartridges and re-install? A. Rest assured, the BROTHER MFC J5320DW ink cartridges are fine. There is nothing wrong with these. Whenever the ink cartridge is not installed properly the printer shows error messages. In this case, you will have to open the ink cartridge access door and remove the ink cartridges that are not in the slot respective to the color code. Every slot has a color unique code assigned according to the ink cartridge. There is no requirement of purchasing a new set of BROTHER MFC J5320DW ink cartridges. Always remember that when you install the ink cartridges, you must follow the color code. The printer is designed that way. If the ink cartridges are not placed correctly then it will damage the printer. Q. I have just replaced the old ink cartridge with new ones but the printer cannot detect the ink cartridge. A “Cannot Detect” message is appearing on the screen. How can I correct this? A. Cannot Detect error messages appear when the BROTHER MFC J5320DW ink cartridges have not been installed properly. Open the cartridge access door and gently take the ink cartridge out. Hold it so that the label of the cartridge is facing the left side of the printer. Now insert the cartridge into the slot and push it till it clicks in place and the release lever can be seen lifted upwards. You have now assured that the ink cartridge is locked into the slot. Repeat the same with the other BROTHER MFC J5320DW ink cartridges in the slot. Q. I am trying to print from the Brother MFC J5320DW printer that I have just purchased. The screen shows “Wrong Paper” message. What is the problem and how can I solve this problem? A. This message appears when the size of the paper in the tray and the paper size settings in the software do not match. Go to the printer software by clicking on the printer icon on your PC. In the window, correct the paper size. It should match the size of the paper that you have put in the tray. You should also make sure that the orientation of the paper in the tray should be correct. Place the paper guides at the indicators according to the paper that you wish to print on. Q. I am unable to access my printer. The screen says Printer Locked. How do I unlock it? A. There is a Secure Function Lock on the printer. You will see 3 icons with a lock on it. Press the one with the username mentioned along with the icon. Now press the Lock On->Off option. This will let you enter the password. You need to enter the 4-digit administrator password. If you enter the wrong password then the screen will display a Wrong Password message. Enter the correct one. Now press OK. You will be able to use the printer. Q. I have just installed the ink cartridge in the Brother MFC J5320DW printer that I have purchased recently. The screen says Install Starter Ink. How do I clear this message? A. This message appears when you do not install the BROTHER MFC J5320DW ink cartridges supplied with the printer. To clear the message, you need to open the ink cartridge access door. Here press the release lever to unlock the ink cartridges from the slot. While doing so, you need to make sure that you release the ink cartridges according to the colors mentioned on the printer screen. Take these cartridges out and install the BROTHER MFC J5320DW ink cartridges. Close the cartridge access door.